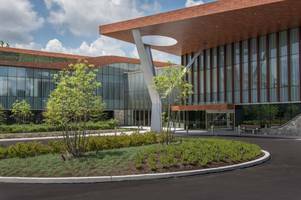 Wausau, Wisconsin (Nov. 2018) – The recently opened Asplundh Cancer Pavilion’s 86,000-square-foot outpatient center in the suburbs of Philadelphia combines state-of-the-art cancer-fighting science with a serene healing environment. Its biophilic design by EwingCole includes an exterior architectural aluminum system finished by Linetec to resemble the look and texture of natural wood. The design team interviewed patients and their family members and engaged the Patient and Family Advisory Council as a sounding board. Local stone, indigenous plants and local contractors were used. Demonstrating its environmentally responsible design and construction, the project’s LEED® certification is in progress with the U.S. Green Building Council. Located on the campus of Abington - Jefferson Health in Willow Grove, Pennsylvania, the new $80 million center offers a comprehensive continuum of leading-edge outpatient care, clinical research and support services in one modern facility. The center is actually two buildings connected by a link and unified by a curving façade, composed of a large glass curtainwall with metal accents. Kawneer manufactured the large, vertical aluminum sun shade fins, and 8- to 12-inch-deep horizontal curtainwall cover plates. Linetec finished these architectural aluminum components in a hazelnut brown, textured wood grain color that captures the look and feel of wood without the associated maintenance. Unlike real wood, the finished aluminum is termite and insect proof, UV and corrosion resistant, and fire retardant. The sun shades and accents maintain their intended appearance in all seasons, and do not swell, rot and warp. Linetec’s wood grain finishes meet the American Architectural Manufacturers Association’s stringent AAMA 2604 test standards for ruggedness, chemical and weather resistance. “Offering long-term durability, the finished aluminum components also are less costly than real wood, providing superior performance and retaining the natural aesthetic,” said Linetec’s Tammy Schroeder, LEED Green Associate. As an environmentally responsible finisher, Linetec applies the wood grain coatings by starting with a powder coat then utilizing a heat transfer sublimation process. This produces no VOCs or other potentially harmful emissions that may be of extra concern to patients and health care professionals. “Linetec performed great on this project and it shows,” praised Bob Kennedy of glazing contractor R.A. Kennedy & Sons, Inc.
Pennsylvania-based R.A. Kennedy & Sons, Inc. performed all of the exterior glazing, which included two- and four-sided structural glazed curtainwall, traditional curtainwall, aluminum entrances, and custom aluminum trims. Kawneer’s aluminum framing was used for center’s four-sided, structural glazed curtainwall. In this four-sided cassette system, glass and subframe were fabricated together by R.A. Kennedy and then installed on site into the curtainwall’s carrier frames. The two-sided system used a conventional structural glazing process. Robert Ganter Contractors of Quaker, Pennsylvania, assisted R.A. Kennedy with the wood grain-finished sun shades and accents. LF Driscoll, located in Philadelphia and part of Structure Tone, Inc., managed the overall construction project, keeping the project on schedule and within budget. Asplundh Cancer Pavilion broke ground in May 2016, was substantially completed in 2017 and opened in June 2018.